Sysessential for TGZ to NSF Converter is an excellent utility for those who wants to migrate Zimbra data into IMB Lotus Notes. One of most prominent things in the application is its support for safe data migration. The tool converts complete data such as contacts, emails, calendars, etc into NSF file format. Every detail is moved into NSF file format in a complete safe way. In order to make purchase of the application, client is required to get all details from the customer care team. They will make you aware how software purchase is possible. Gain info such as software’s cost and payment option also defined in a systematic way. If user does not want to migrate complete data from Zimbra into Lotus Notes then make a choice of data. Choose only those files that user wants to access in Lotus Notes. This is a time saving option. The application supports carrying out comprehensive data export without causing any sort of data loss. Batch data migration does not affect data integrity at all. Software assures that no single data remain left from migration. The download of freeware demonstration run will show the working of the software and help in acknowledging the features. There will be migration of first 10 emails per items, which will clear out the functioning process. It is always ensures that folder structure is not altered. It is comfortable for users to access folders such as newly defined folders, sub folders, predefined folders etc get migrated into NSF file format. Overall, original formatting remains same even after migration. How much a non-technical user is comfortable to work with the software? The functionalities of the tool are automated and at the same time complex-free. This is why a non-technical won’t face any hurdles while running the application. What is the process software utilizes for migrating TGZ into NSF? Software runs on simple process. It uses easy to operate steps and carry out simple steps. It is always ensures that simple process is utilized so that no hurdles ever come across. By downloading freeware demonstration run, you will find comfortable to run the software tool in free mode. 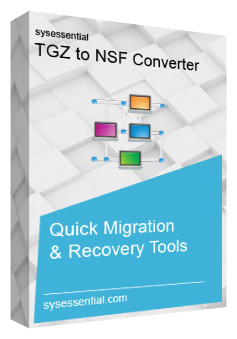 Test the functionalities closely and catch the ways to migrate emails from TGZ emails into NSF file format. Also, free trial edition show the features used via application. Watch the conversion of first 10 emails per item from TGZ into NSF file format. Is file size limit matters while making data export? If your TGZ files are very large in number, then also tool performs migration in a safe way. There is hardly any need to lose hope. It is a strong email migration solution meant for large sized files. In how many steps data migration expected? Sysessential always create user-friendly interface. In the phase where bulk data migration is involved, there tool performs quick conversion. It takes few minutes in the completion of comprehensive data migration. How much safety is expected from software? The application is an ultimately safe to use application. You can use it when you have TGZ emails for moving into NSF file format. The tool is complete and safe in the sense that it is fully protective from causing issues like virus, malware problems and so many more. I am inclined to IBM® Lotus Notes email application because of excellence in features. But before switching onto Notes, it is not worthy to leave my emails into Zimbra. I want those emails at any cost. This is why I decided for buying some professional tool in this regard. Sysessential for TGZ to NSF Converter supports performing emails in a safe and quick manner. I liked the application very much because it is time saver and money saver both. An unfortunate shift to Lotus Notes created confusion in our organization last week. Thank God Sysessential for TGZ to NSF Converter is there. It has migrated bulk emails from Zimbra into newly shifted Lotus Notes email application. I found the application to be full of excellence. It is so fast to run that bulk email migration is done in few minutes only. We were all surprised over its performance. Lastly, everyone appreciated me for choosing Sysessential for TGZ to NSF Converter application.